From The Boston Globe/Boston.com's "Arts & Entertainment, Exhibitionist: Inside. Back stage. Behind the scenes." In the afterglow of the Institute of Contemporary Art's (ICA) announcement of an opening date, I stumbled upon this fascinating chunk of recent history. Harry, the Labrador retriever, not only attended the ICA's ground-breaking in 2004. 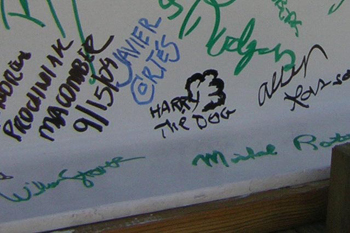 He was also one of the dignitaries to sign the beam to be placed in the new building's foundation. Why were you at the ICA for the ground-breaking? I've been so busy with obedience training, agility training, and watching Sally that I forgot to respond to your questions about the ICA. Cynics say that dogs can think only one thought at a time, which is something I guess I've proven by getting so distracted. I went to the ICA ground-breaking for several reasons. First, I was under the misimpression that ICA stood for Institute of Canine Art. I've learned subsequently that it's a museum that goes way beyond that and encourages fresh thinking and creative energy from humans too. That's great. Second, I attended the ground-breaking for much the same reason a human would want to be at an archeological site. When they turned over the earth, they uncovered scents that had been buried at an earlier time in Boston's history. And what a history it's been, wouldn't you say. And then to realize that the new site for the ICA is in an area that has been relatively dormant to development all these years. Wow! And that the new ICA will be the first new museum in the city for a hundred years. Bow Wow! But I'm digressing from your questions. My third reason for attending was that I was enthralled with all the people present, from clowns in gowns to the powerful and prominent. I have to admit that distinguishing among the many had me a bit confused at times. And I liked the music that the band was playing. From your perspective, as a dog, what did you see that humans might have missed? What I noticed that some of the humans might not have been concerned about was the way the birds were circling overhead (I'm a lab after all). The event attracted birds that ordinarily don't hang around much. Usually they're soaring and having a high old time on the wind currents. But on that day, they circled and observed the activity below. And then they spun off to spread the news of the new location of the ICA to parts far away. I also noticed that the humans all had smiles on their faces. That's not a very common observance, especially in Boston. I do notice it more on the Cape, especially in the summer on the beaches. And because it was a sunny and warm day on the day of the ground-breaking, the smiles were really wide and genuine. People were pretty happy that the digging was underway. How canine like when you think about it. How disappointing has the postponement of the ICA's opening been for you? The delay has really done nothing to remove the smiles as far as I've noticed. The work is proceeding on the site with great strides, and what's in a schedule anyway. Humans could learn a lot from dogs if they would more easily just get up in the morning and go about their day. You never now what you're going to find along the way. And if all you do is rush to get somewhere, you miss all that is in the journey. When it's finished, the ICA is really going to be ground-breaking. I can't wait, but I'm in no haste if that makes any sense to you. What are you most looking forward to about the building? I'm looking forward to languid days at the ICA basking in the sun and looking out over the beautiful Boston Harbor. I'm looking forward to day after day of smiling faces and crowded events as new works are unveiled and new visitors arrive for the first time to see mind-expanding creations. And I know that the heart will expand too as these works touch on human emotions. We dogs are more adept at picking up the subtleties of human concerns, joys, and mood swings. The new ICA will be a boost to the city's mood, especially on cold and windy days, those that blow in the winter. The ICA will be like lying by the fire in a cozy mountain cabin. The ICA has made sure its dramatic bleacher section -- which overlooks the Harbor -- is accessible to people with disabilities. Has the ICA done enough to make the new museum dog friendly? I'm hoping that the ICA will be creative with its grounds and open spaces. I'd love to see them provide equipment for me to enjoy as an outlet for my new competence with agility training. The jumps and tunnels and seesaws and A-frames are also quite colorful when set up on a site. But if the ICA simply provide the scoop bags and other wastebaskets that make the site more appealing to human walkers, they'll be doing a good job. I've been really impressed with how well people keep up the appearance of Castle Island, which makes it a lot easier for us dogs to go run around and have fun without getting in anyone's way. Finally, Wolfgang Puck is going to run the ICA restaurant. Do you have a suggestion for a couple of dishes? I'm excited by what possibilities Wolfgang Puck brings to the mix. We dogs and Wolfgang have lots in common as his name would tell you. He's one of us. All in all, the new ICA is something everyone can and will enjoy. And as Wolfgang's name reveals, so too does the name Medvedow. It's dogspeak for "Open your eyes and your heart," which is what we dogs and ICA director Jill Medvedow are all about.